The What: Biamp Systems is now shipping the TesiraFORTÉ DAN range of audio processors. The result of collaboration between Biamp and Shure Incorporated, these new audio processors directly interface with the Shure MXA beamforming line of microphones. Along with the new dedicated Shure MXA input blocks in the latest Tesira 3.0 software, the processors deliver interoperability between advanced DSP and microphone technologies. The TesiraFORTÉ DAN will be displayed at the Biamp booth (3-A75) at ISE 2017, February 7-10 at the Amsterdam RAI Exhibition and Convention Center in Amsterdam. The What Else: The TesiraFORTÉ DAN is available in four fixed I/O models—the same models as the original TesiraFORTÉ family (AI, CI, TI, and VI)—with the addition of 32x32 channels of audio via the Dante Brooklyn II module. All models of TesiraFORTÉ DAN are standard with 12 mic/line inputs, eight line outputs, Ethernet control, RS-232, USB audio with up to eight channels of configurable audio, four general purpose I/Os, and an OLED display. The Bottom Line: The TesiraFORTÉ DAN VI, TI, and CI models feature Biamp's AEC technology to eliminate acoustic echoes and feedback for a natural-sounding audio experience. Users can centrally or remotely control the devices with Tesira's software program. 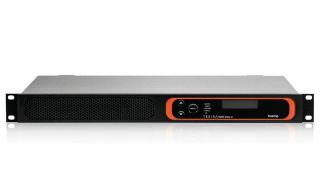 The system allows direct native connectivity to devices such as the Shure MXA910 ceiling microphone, enabling integrators to better design, install, and commission conferencing systems for their customers.